Breakfast seems to be one of those meals that’s not as easy as a bowl of cereal, or a slice of toast once choosing a healthier lifestyle. This easy, filling recipe will have you loving a quick breakfast again. Quick, easy, and perfect for on-the-go! Preheat oven to 375 F. Heat the oil in the skillet over medium heat. Saute onions and garlic until translucent. Add mushrooms and fry until mushrooms are cooked. Add spinach and cook until spinach is wilted (may have to add a bit of water to “steam” the spinach). Set aside and cool slightly. In a bowl, whisk eggs. Add the chopped red peppers, cheese, salt, pepper, zucchini and spinach mixture. Mix well. Fill each greased muffin cup with egg mixture 2/3 of the way full. Bake for 20-25 minutes, or until it’s well set and a tester/toothpick inserted into the centre comes out clean. Leave in the muffin tins for a few minutes or just until it’s cool enough to handle. Cool completely before refrigerating. Muffins will keep about a week in the refrigerator. These freeze EXCELLENT! I make a huge batch and freeze the rest. Perfect for breakfasts on the go, or when you just don’t have time to be in the kitchen! Can be served with a side of kimchi, or add to a fresh simple salad. Re-heat in oven, or take out the night before and place in fridge to thaw for the next day. 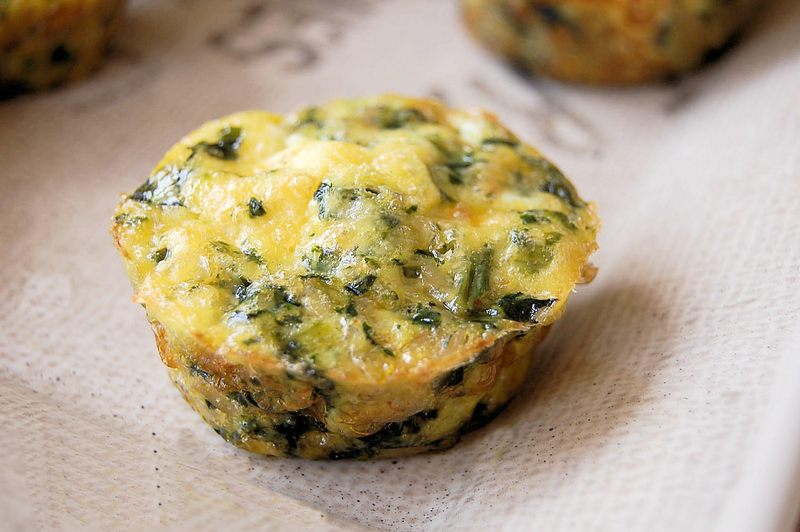 As a variation, skip the muffin cups and bake this recipe in a baking dish and serve for Sunday brunch!